Dozens of places to take your dog in Tampa Bay, St. Petersburg and the entire region. LARA CERRI | Times Sue Weyhe, of St. Petersburg, hangs out with her family's 4-year-old Goldendoodle, Duke, while waiting for the American Stage in the Park's production of "The 25th Annual Putnam County Spelling Bee" Sunday, April 28, 2013 at Demens Landing. Sunday night was Pets in the Park where several people brought their canine pals out to share a blanket and watch the show. Weyhe joined her family to celebrate the birthday of her daughter, Liz Dunn, who owns the dog. Dunn and her husband Billy Dunn also brought their two kids, Libby, 8, and Liam, 10, as well as Zachary Anderson, 11. 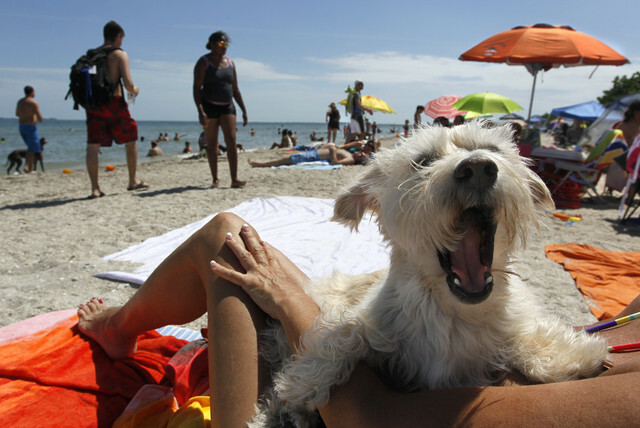 DIRK SHADD | Times Sparky, 5, from Brandon, takes a big yawn while relaxing in his owners lap, Karen Sellner, 63, at the dog park area near the Bay Pier at Fort DeSoto on Memorial Day (05/27/13). Sparky, who is a West Highland Terrier mix, gets to visit the dog beach once a week. "We come every Monday, no matter what," Sellner said. "It's incredible here today. This is the place to be with your dog and your family." Dogs are more welcome in public than ever these days. Bars and restaurants are making themselves more pet-friendly, and you can find weekly "yappy hours" happening at spots all over Tampa Bay. Add to that a healthy number of dog-approved events and even retail stores, and you can be pretty active without ever leaving your pup behind. Here are some local spots where dogs are not only allowed, but are encouraged. Prost Kitchen + Bar: Prost means cheers in German, but your pupper, German shepherd or otherwise, can enjoy half-off everything on Prost’s dog menu the first Wednesday of every month from 5 p.m. to closing, with proceeds going to local shelters. Humans can enjoy German beer, schnitzel and other European gastropub fare in the University of South Florida area. 2802 E Bearss Ave., Tampa. prostkitchen.com. Ferg’s: Want to watch the game with some wings, a brew and your best friend? 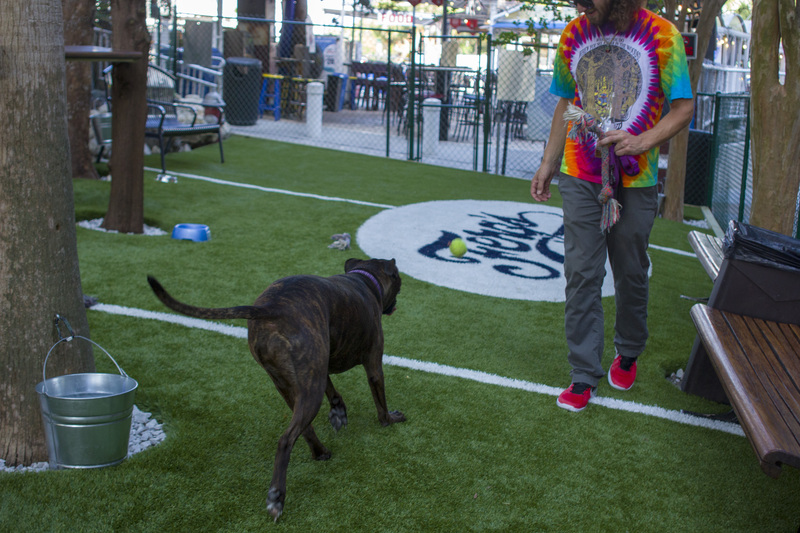 The massive sports bar recently added a football field-themed dog park where your pet can be off-leash and you’ll never be out of range of a TV. The new dog menu has "chips" (dehydrated sweet potatoes) and beer grain hush puppies made with peanut butter, eggs and grain from local breweries. 1320 Central Ave., St. Petersburg. fergssportsbar.com. The Honu: This "lei’d back" Hawaiian-themed spot welcomes humans with grilled fish sliders with pineapple tartar on Hawaiian rolls, while furry friends on the lanai can get doggie tacos and peanut butter and carrot muffins. 516 Grant St., Dunedin. thehonurestaurant.com. Sweet Sage Cafe: Dogs are encouraged on the tranquil, greenery-filled patio where the dog menu includes a "Beagle" — a dog bagel with salmon. Plus, you’re only five minutes from the off-leash dog park at the Madeira Beach City Centre. 16725 Gulf Blvd., North Redington Beach. sweetsagecafe.com. TheBungalow: For $5, you can buy your dog a stylish Bungalow bandana to support the Humane Society of Tampa and you’ll get half off your first drink (can we recommend a Bungalow Ice Tea?) every time your dog wears it. 2202 W Kennedy Blvd., Tampa. bungalowtampa.com. Square1: Humans get more than 20 types of specialty burgers, from the Toga Party topped with feta to the Double Bacon Boomer Sooner, while dogs get unseasoned ground chicken and broccoli. Unfair? Maybe, but we won’t tell if you give the dog a bite of your burger. 2042 Badlands Drive, Brandon. square1burgers.com. Want dessert? Bo’s in Seminole Heights will serve you a doggie ice cream with little milk bones in it, and every dog that visits Dairy Joy in South Tampa gets a little ice cream cone. Swah-Rey in St. Petersburg sells a "pupcake" made with carrot and peanut butter. 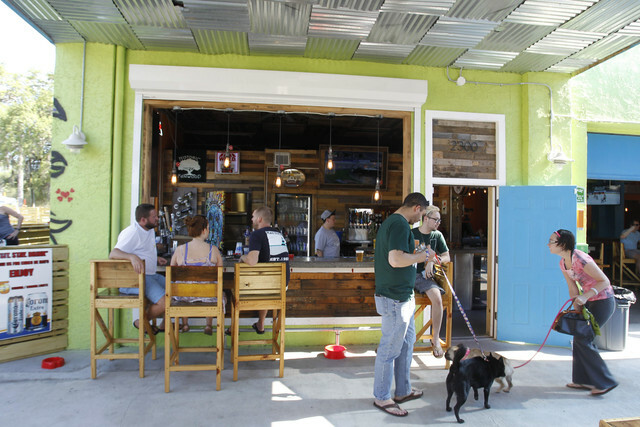 Breweries: Many of Tampa Bay’s craft breweries are dog-friendly, indoors and out, but some are better than others in terms of space, shade and chill level. St. Petersburg’s Pinellas Ale Works, or PAW, is dog-themed, with beers such as Piddle pilsner and Milk Bone sweet stout. Their big, gated back patio is a great spot for dogs, though they’re allowed indoors in the air conditioning too. They host a yappy hour on the last Thursday of every month to benefit Friends of Strays. 81Bay in Tampa is probably the most spacious brewery in Tampa Bay, a good choice if your dog is better without a ton of people in close proximity. If you’re looking for outdoor space, St. Petersburg’s Green Bench Brewing Company has a large lawn. Yappy Hours: Many bars and restaurants run regular "yappy hours" with drink specials. Here’s an incomplete list, with specials benefitting animal charities. • Irish 31 Hyde Park, first Monday of the month, 6 to 9 p.m. 1611 W Swann Ave., Tampa. • Garden Cafe, second Thursday of the month in the evening. 14227 Seventh St., Dade City. • Gaspar’s Grotto, first Saturday of the month, 3 to 6 p.m. 1805 E Seventh Ave., Tampa. • Yard of Ale Tampa, second Sunday of the month, 3 to 6 p.m. 406 S Howard Ave., Tampa. •The Living room, The Living Room on Main, weekdays from 1 to 5 p.m. ($2 from every meal sold off the dog menu goes to animal charities). 487 Main St., Dunedin. 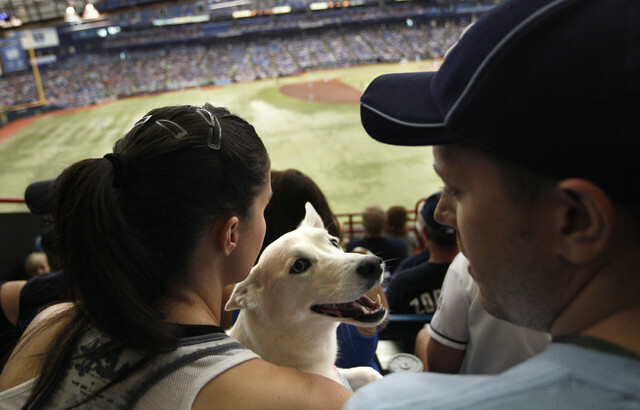 Baseball games: The annual Dog Day at the Rays, above, returns to Tropicana Field on Sept. 16 when the Rays play the Oakland Athletics. There will be giveaways, a doggie kissing booth for photo ops and a Plinko game to benefit animal charities. For $30 you get a seat for you and your pup on the tbt* Party Deck. Buy tickets at mlb.com/rays/tickets/specials/themes/dog-day. If you can’t wait until fall, the Dunedin Blue Jays minor league baseball team has Bark in the Park on April 28 at Dunedin Stadium ($7 human tickets, $3 dog tickets at dunedinbluejays.com). The Clearwater Threshers Dog Days of Summer promotion welcomes dogs at every Sunday home game at Spectrum Field this season. Dog tickets are $6 at threshersbaseball.com. The movies: Preserve the ’Burg recently announced its lineup of Movies in the Park, 7 p.m. Thursdays in St. Petersburg’s North Straub Park for the month of May. Movies include Michael Keaton’s 1989 Batman, Father of the Bride and Back to the Future. Dogs are welcome. Shopping: The Hyde Park Village outdoor mall in South Tampa prides itself on being extra dog-friendly. Leashed dogs are welcome outside and on restaurant patios. They’re also welcome indoors at Albisia Jewelry, Anthropologie, Buddy Brew, Carlton Ward Photography, Francesca’s, Juxtapose Apparel, Pottery Barn, the Shade Store, and the mall’s only shop for dog accessories, clothes and treats, Downtown Dogs. The St. Petersburg Saturday Morning Market, running October to May at Al Lang Stadium, is pet friendly and has dozens of food, produce and arts vendors. The beach: There are places in Tampa Bay where your dog can get in the water, such as the free Davis Islands Dog Beach in Tampa, but when it comes to a legit beach with enough sand to lay out on, where you’ll see humans and dogs swimming in the ocean together, the dog beach area at Fort De Soto Park, above, in south Pinellas County is the only option for off-the-leash fun. Luckily, it's a good one. It’s $5 to park. You can also have dogs in designated areas of Honeymoon Island to the north, though park rules state they must be on a six-foot leash at all times. On a boat ride: The Shell Key Shuttle offers a 90-minute sunset cruise and sight-seeing tour through the residential waterways and undeveloped barrier islands south of Pass-a-Grille and on certain dates runs "howl at the moon" tours where dogs (one per human) are welcome and ride free. $25 for adults and $12.50 for children 12 and younger. For dates and reservations call (727) 360-1348. Live theater: American Stage presents its annual Pets in the Park Night, left, on May 6 at Demens Landing on the St. Petersburg waterfront, where the theater company is staging Mel Brooks’ The Producers this year. It’s the only night dogs are allowed. Tickets, $18 and up, are available at americanstage.org/park. Japanese scientists say they've provided the first experimental evidence that cats can distinguish between words that we people say.